The shift from systems-on-chip (SoC) to manycore architectures brings new hardware and software challenges ranging from seamless integration of processors, memories the design of modular systems and application software to run on massively parallel and scalable platforms. Manycores will benefit tremendously from 3-dimensional (3D) integration technology that enables distribution in space of computational and storage functions to achieve unprecedented performance levels. PROD3D is an ambitious high risk and high reward project that builds upon existing European world-class R&D expertise of the partners. PRO3D will innovate in both hardware and software technologies and demonstrate the effectiveness of manycores by an integrated and concerted effort in key aspects of hardware and software design. The uniqueness of this proposal stems from the experience of the partners in various aspects of manycore design that need to be addressed concurrently. 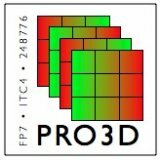 Extend the software flow to 3D-stacked manycores.